Despite a reputation as the most difficult climb, Umbwe is still just a trek, with no actual climbing involved. That said, it is steep, and in places you’ll be holding on to tree routes as you haul yourself up the slope. Nevertheless, the rewards in terms of scenery and solitude are more than ample. Note that the following itinerary is for just five days – which we advise against. So please do build an extra day into the itinerary to help you acclimatize properly and give you the greatest chance of reaching the summit of Africa’s greatest mountain. 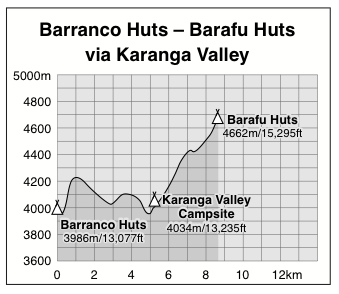 Most tour companies will arrange to stop at Karanga Campsite at the end of Day 3 (see below). 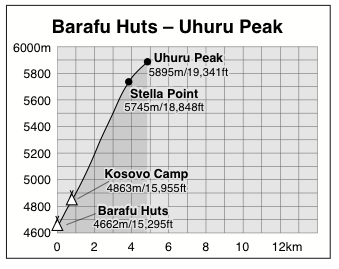 The following itinerary assumes you are heading via Barafu Huts and Stella Point to the summit, though this is one of the routes where you can climb to the Crater Rim via the Western Breach and Arrow Glacier. As the closest gate to Moshi, getting to the start of the Umbwe trail is uncomplicated. With the Umbwe Route one of the quietest on the mountain, too, it follows that you should be one of the first people to begin your trek on the mountain that day. Wallowing in the splendid tranquility of this route, most people nevertheless find the first day quite taxing as they march up Kilimanjaro’s southern slopes under the humid forest canopy. Thankfully, there are plenty of features to distract you from your labours, including colobus and blue monkeys as well as impatiens Kilimanjarii, the striking red flower that many consider to be the most beautiful on the mountain. Joining a ridge, you eventually arrive at your campsite for the first night, the wonderful Umbwe Cave Campsite (2944m), buried deep in the forest. As with every night on the trek, you will arrive to find your tent already erected and a snack awaiting, with dinner served in the early evening. There are a couple of surprises awaiting you on this second day. The first is the fact that your guide and myself will already be setting a deliberately slow pace in order to help you acclimatize. The second is that, whilst your campsite last night seemed to be in the heart of the deep, dark forest, it’s not long on this second day before the forest starts thinning out and you enter into the heath and moorland zone, with fantastic views down to the valleys on both sides. Some of Kilimanjaro’s most famous plants, including the weird senecios and lobelias, now decorate the trail as we continue our climb, with gorgeous views all around including, for the first time, the Kibo summit itself. Continuing up the southern slopes, you may find it surprising that the path, for virtually the first time on the entire trek, actually drops for a few minutes as it winds its way round to the Barranco Campsite (3986m) – many people’s favourite on the entire mountain. At the summit of the wall the path drifts and meanders gently to the Karanga Valley, a gorgeous little place where malachite sunbirds flit from flower to flower. If we were on a seven-day trek we would find our campsite lies at the top of the other side of the valley, a stiff but short climb up from the Karanga stream. Both lunch and dinner will be served at this campsite. But for a six-day climb we still have another three hours or so to go as we traverse the southern side of Kibo, walking through a spectacular lunar landscape bereft of life on our way to Barafu Camp (4662m), on the south-eastern shoulder of Kibo. Here we will rest, take lunch and dinner, and try to get some sleep before the rigours of the night ahead…. Distance: 4.86km to Uhuru Peak; then 11.5km descent to Mweka Camp Altitude Gained: 1233m to Uhuru Peak, then a descent of 2789m. Arising at around midnight, we begin our slow march up to Stella Point (5745m) on the edge of the Kibo crater. It’s a steep, slow, cold march and a test of your endurance – this is where you’ll earn your Kilimanjaro certificate. Nevertheless, providing you have avoided altitude sickness and have acclimatized well, there is no reason why you shouldn’t make it up to Stella Point. This we reach, all being well, at around 5am, though it can be much later depending on your condition. From Stella Point it is a mere 45 minutes further on, past glaciers and snowfields and with views over the Kibo Crater, to Uhuru Peak – at 5895m the highest point in Africa! Here, if we’re on time, we can watch the sun rise over the African continent, take photos – and take a breather too! After a rest at the top, we continue back down to Barafu Camp – a walk that is considerably quicker than it was on the way up! At Barafu we take breakfast and relax for an hour, before continuing our march down the mountain, this time on the Mweka Trail. Today’s walk takes us back down through the alpine desert, heath and moorland zones until we once more enter the forest zone via Millennium Camp (3827m). There, amongst the trees, we find the Mweka Campsite (3106m), our final stop on the trek. We should arrive there at about 4pm – and you have been walking for around 16 hours, less breaks! Exhausting but, if you made it to the top, you’ll think it was worth it!